Afternoon tea scones are a quintessential part of British culture. 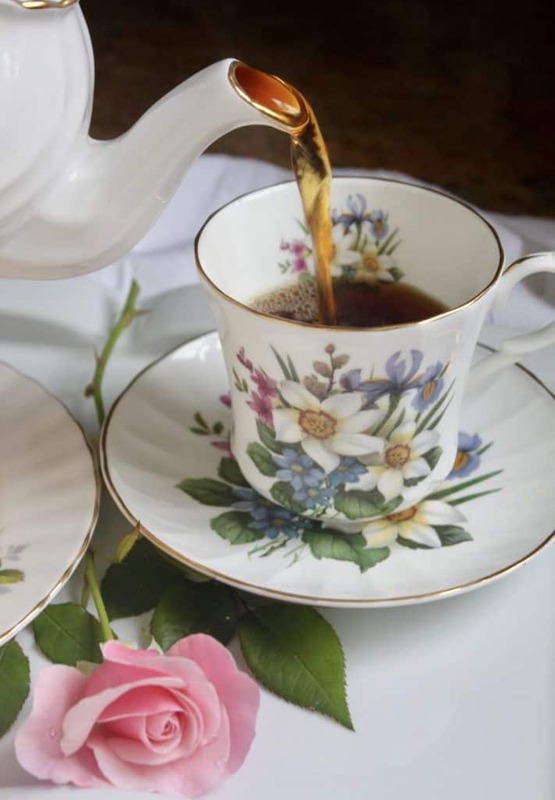 Of course, with the upcoming royal wedding, tea and scones will be a requirement whilst watching! 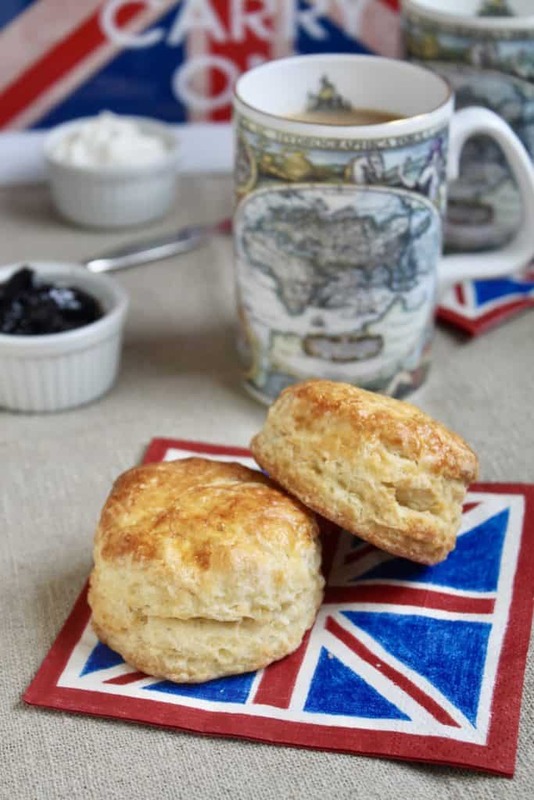 Learn how to make the best scones using my tried and tested scone recipe, and how to serve them with a lovely cup of proper British tea. Unfortunately, I have a lot to say about scones. This post contains Amazon affiliate links for your convenience, at no additional cost to you. Scotland’s bakeries and tearooms have to be among the best in the world. The sweets and savory treats being created in these places, are often beyond description, so my standards are high. I’m also going back to the UK enough to keep getting the “real thing” which keeps my standards high! 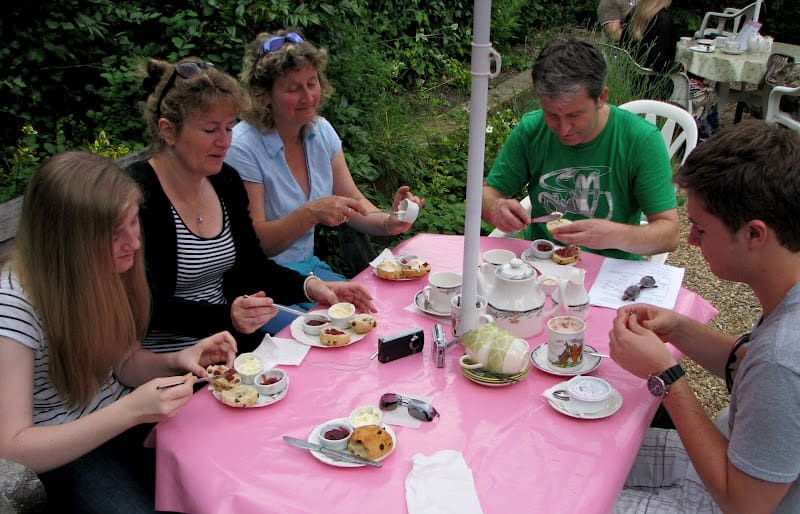 We were just in the UK last July, and were lucky enough to have so many wonderful scones! Afternoon tea scones can be served very casually. My wonderful Aunt Rosa made us her homemade afternoon tea scones the day we left to go to Scotland. 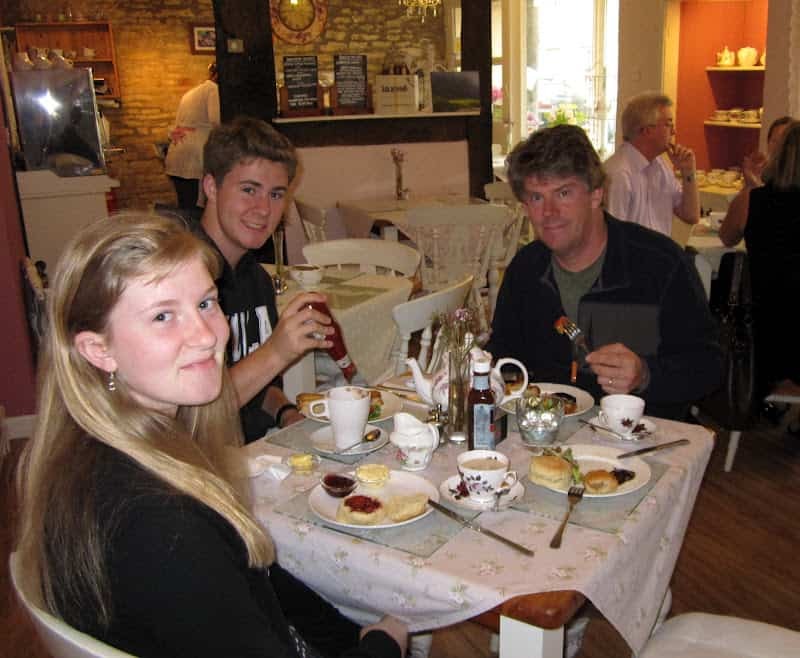 Then, we found the loveliest little tearoom called the Sweetapples Teashop, in Marshfield, England. 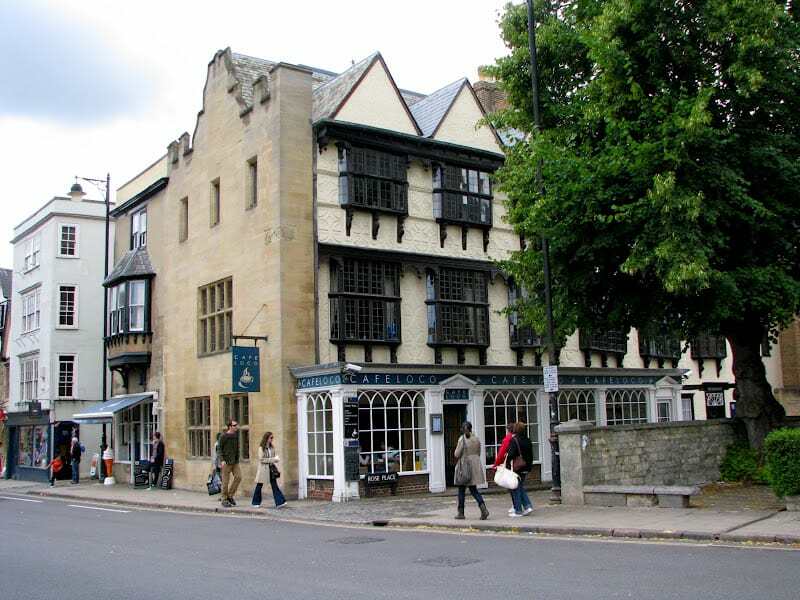 I was so excited to have tea and scones at Cafe Loco in Oxford, an Alice in Wonderland themed tea room in a 500 year old building! While in London, I bought a scone from Harrod’s for only 65p (about $1) for my daughter, which she ate the next morning and it was still incredible the next day! Yes, I’m asking myself the same question you probably are: why did I only buy one?! 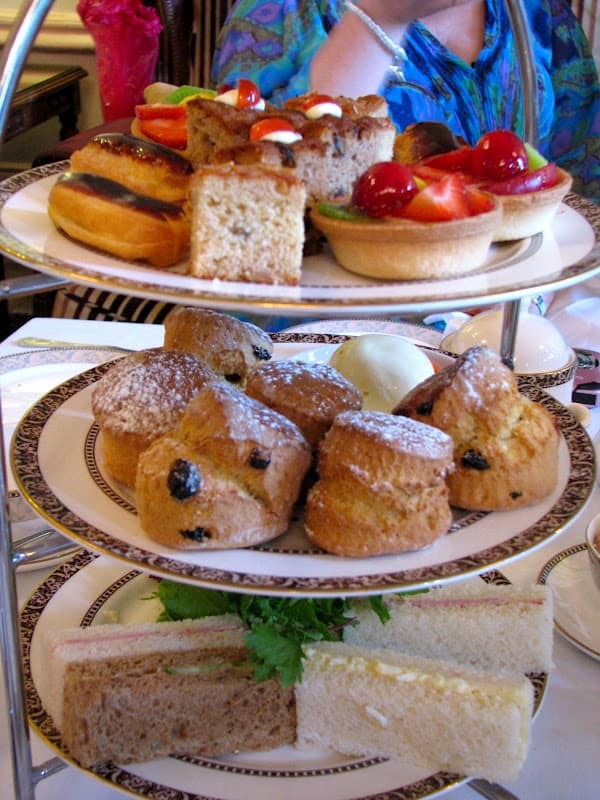 However, afternoon tea scones can also be served quite a bit more formally, as they do at Down Hall in Essex. Oh, I do love scones! As you can see, good afternoon tea scones come in all shapes and sizes. Traditionally, they are plain or have raisins, or currants. They must be light and well-risen to be considered really good scones. Many times when my mother and I attempted to bake something British here in the US, it wouldn’t turn out the same. Of course, the flour is different, so are the milk and eggs and all the other ingredients, so it’s not surprising. However, we’ve always kept trying to replicate certain things we loved from when we lived in Scotland. Scones are one of the bakery items we baked a lot. I must have tried a dozen or more different recipes until I created this one myself. Now, it’s the only scone recipe I use. In my quest to find the best scone recipe, I learned many things which result in lighter, and more perfect scones. 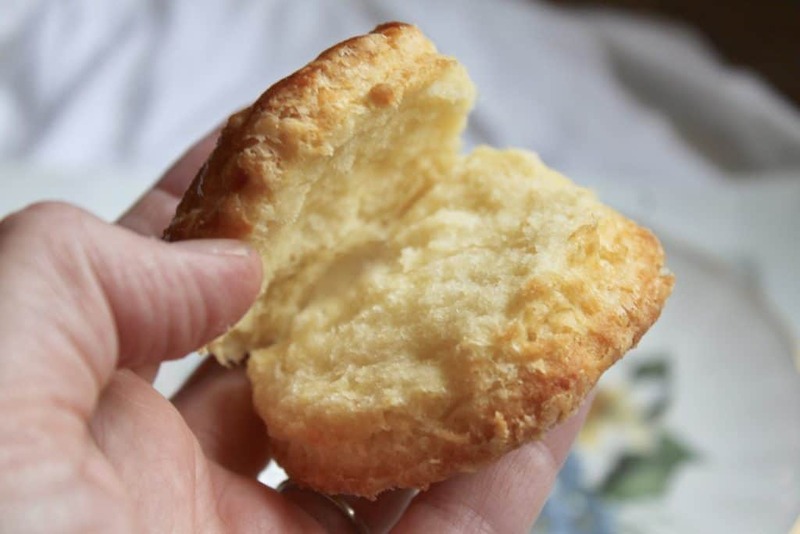 A proper scone will break apart with your fingers. (My) GOLDEN RULE OF COOKING-Use QUALITY ingredients! And no, American biscuits and scones are not the same thing. They look similar, but that’s all. They are made differently using different ingredients. I love to make a double batch of these and bake half, then freeze the other half (unbaked.) It’s very easy if you place them on a well-floured tray and put them in the freezer, uncovered. Leave them for about two hours, until frozen, then remove them from the tray and place in a freezer bag, and return to the freezer. This way you can bake one, two or as many as you want, whenever you want warm, freshly baked afternoon tea scones, with no mess to clean up! 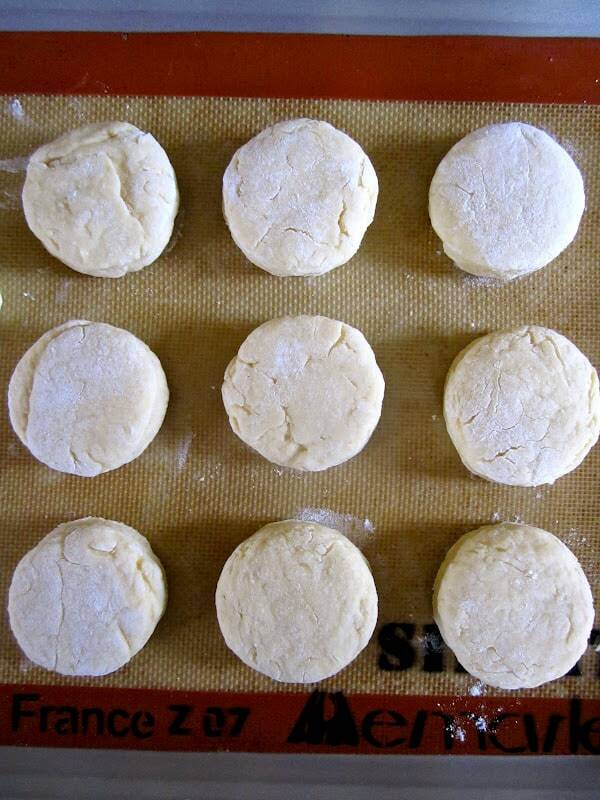 You can also bake the scones and freeze them as soon as they have cooled completely. However, the first method is my favorite way to freeze them as you will end up always eating a freshly baked scone. Afternoon tea scones are perfect for Valentine’s Day, Mother’s Day, birthdays (including having a tea party for children), and of course, afternoon tea! In case you didn’t know, there are lots of different types of scones. I don’t mean currant scones, or orange cranberry scones. You could make girdle scones, or potato scones or soda scones, for example. Printable recipe is at the bottom of the post. Isn’t this a great idea for Valentine’s Day or Mother’s Day? In a bowl, place the dry ingredients. Mix lightly to combine. In a measuring jug, put the buttermilk (including the 1 tbsp.) 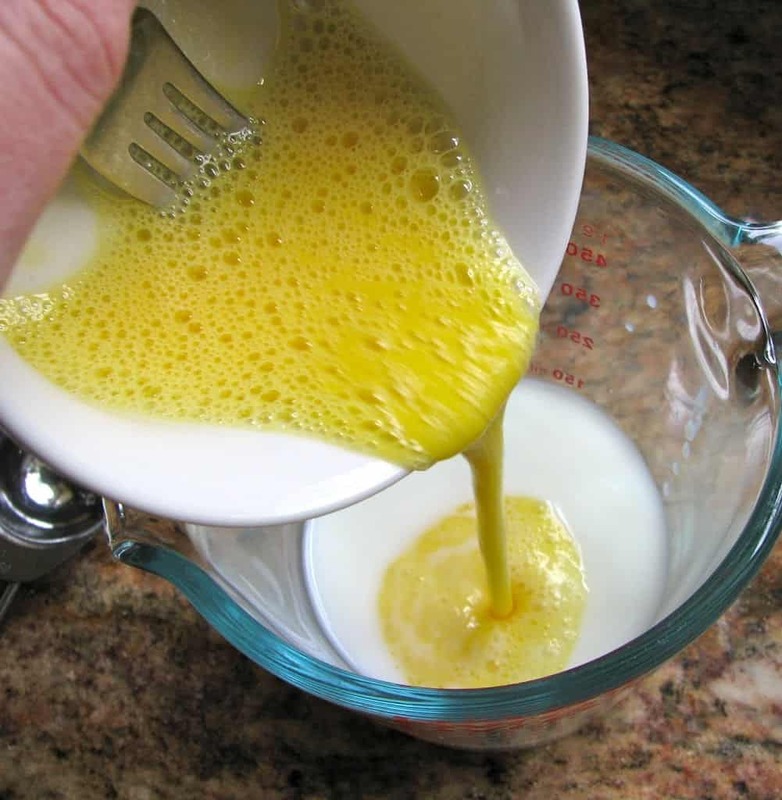 Beat the egg in a small bowl, then pour into the buttermilk and mix well. Place the butter in the center of the dry ingredients and cut with a knife into about 16 pieces. 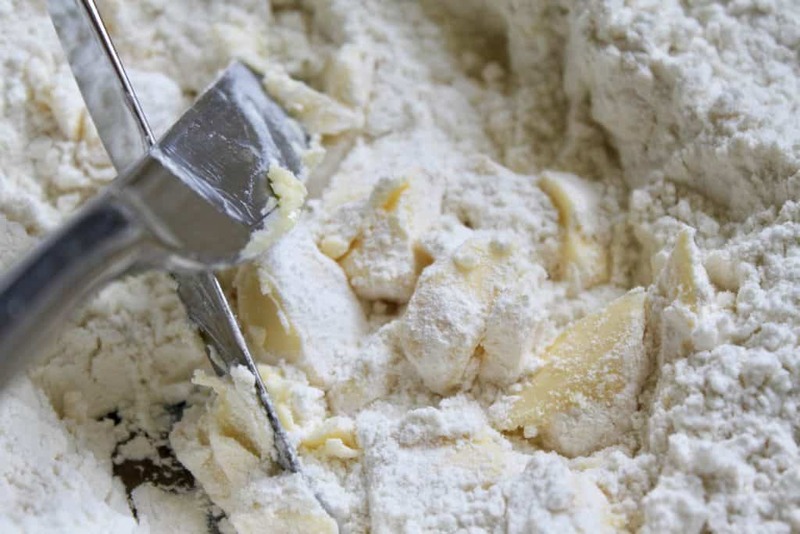 Next, take another knife, pastry blender or your hands and cut/mix the butter into the flour until it resembles coarse crumbs. Make a well in the center of the dry ingredients and pour in the egg and buttermilk, *reserving one tablespoon of liquid in the jug. Mix gently with a wooden spoon until a dough forms, just about 10 seconds. If you are adding dried fruit or any additions, add it now. 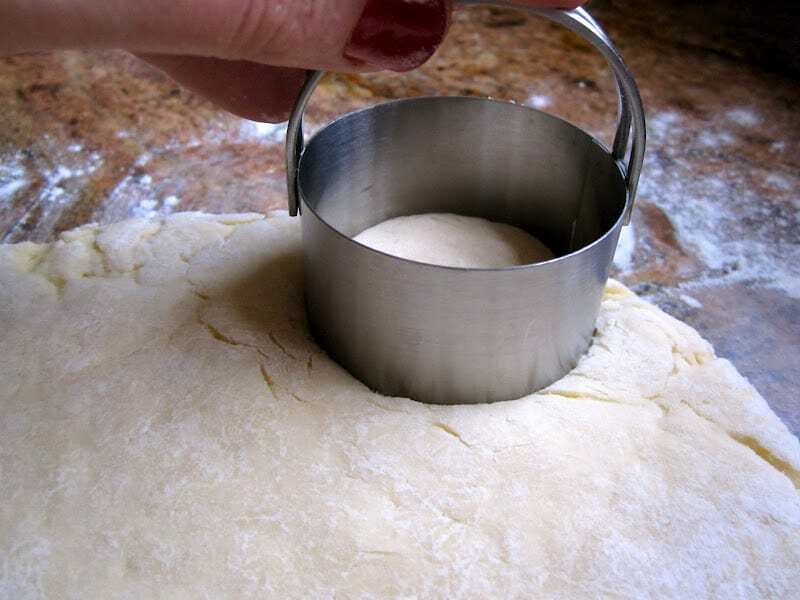 Roll and cut the dough. 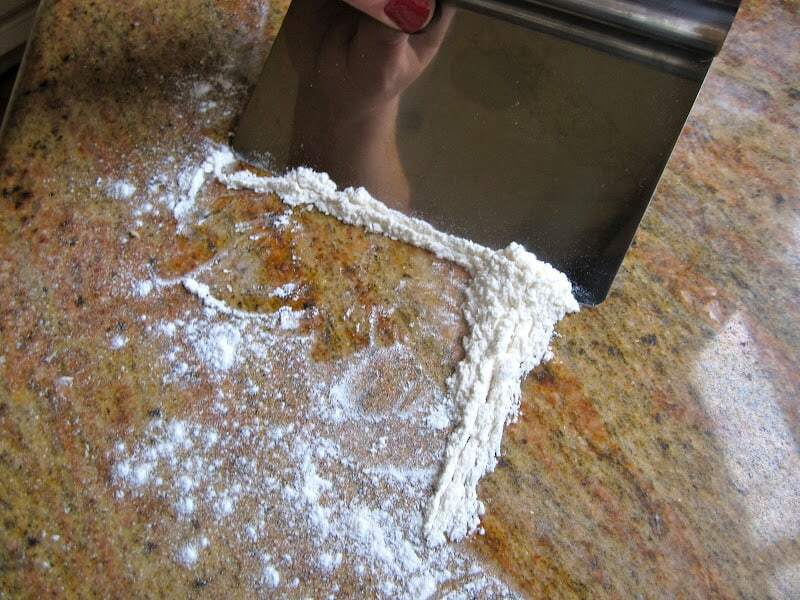 Place dough onto a clean, well-floured surface. Gently, form into a ball, then pat out, or roll. 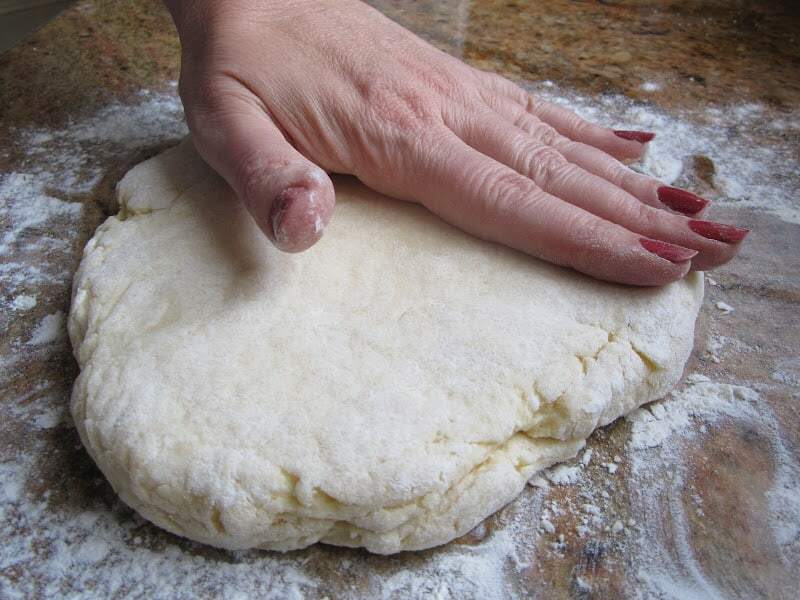 Fold the dough over once, then roll or flatten to approximately 3/4″ in thickness. Do not knead the dough or it will make the scones tough. With sharp cutters, cut out scones. Use whatever size you prefer; larger or smaller. Place on silicone baking mat or parchment lined baking tray. Gently knead scraps together and repeat until dough is finished, (make a “runt” with the remaining little bit of dough). Don’t worry about cracks and imperfections in your scones. 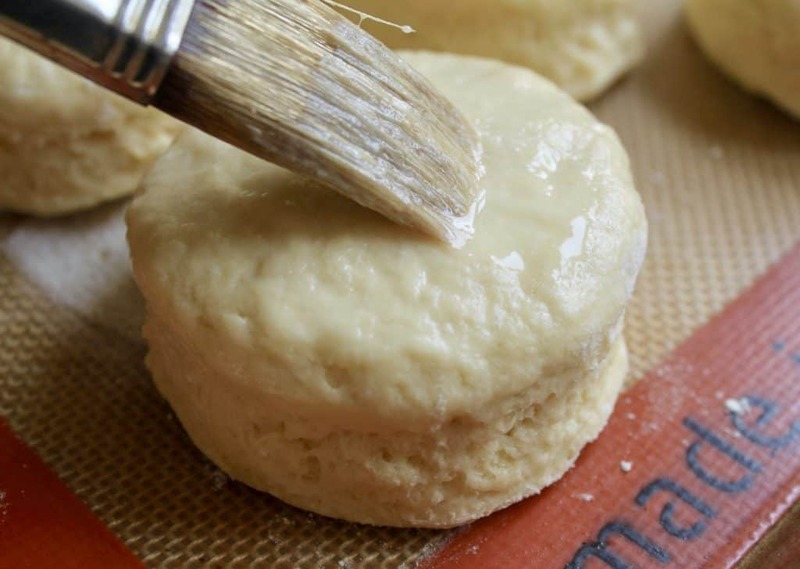 Using a pastry brush, brush the tops of the scones with the remaining egg/buttermilk mixture. Place in middle of preheated oven for about 9 minutes, then turn tray and continue to bake for another 9 minutes or until the afternoon tea scones look golden brown on top. Meanwhile, cleanup is super easy if you have one of these little pastry scrapers! Remove from oven, and tray, then place in a towel lined basket, or cooling rack if you wish to serve them on a plate. 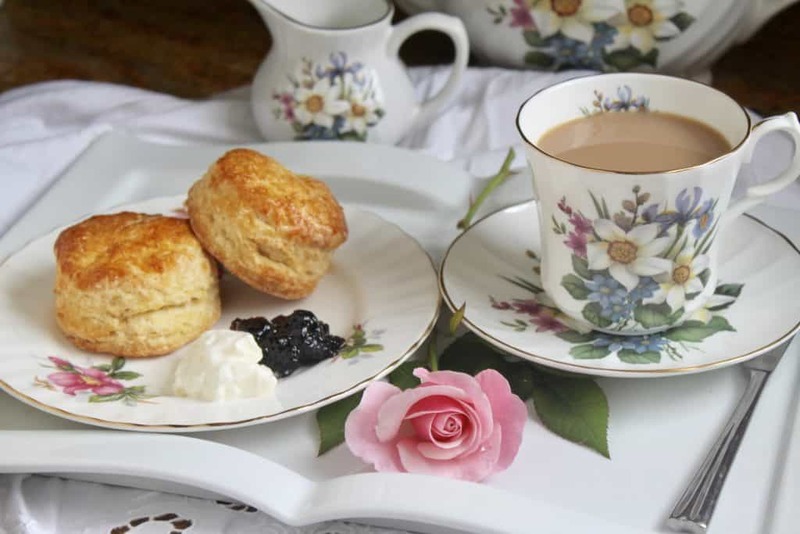 There are several ways to serve scones, but the most traditional is with raspberry jam and clotted cream or Double Devon Cream; and since the latter two are hard to come by in the US, freshly whipped cream (no sugar added). Please do me a huge favor and do not ever serve these with any non-dairy whipped topping! 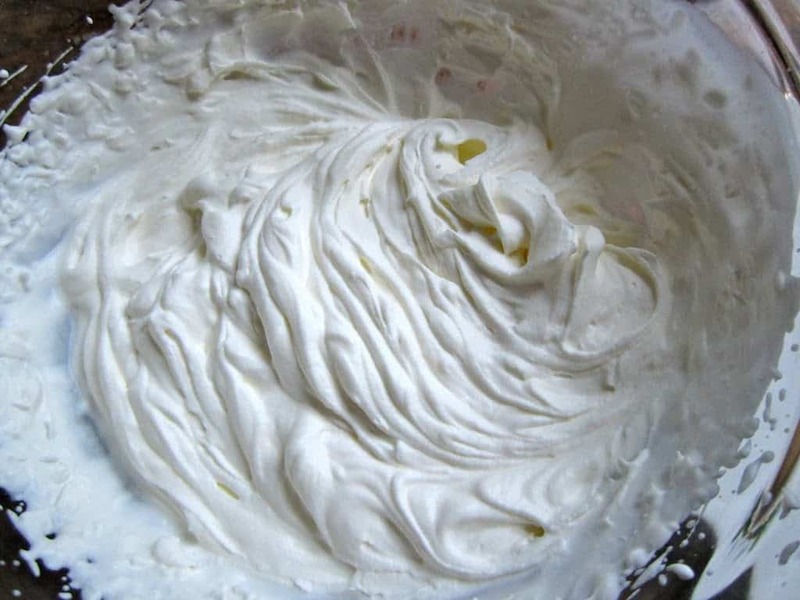 If using fresh whipping cream, whip until thick (an organic cream with no added ingredients will taste best). 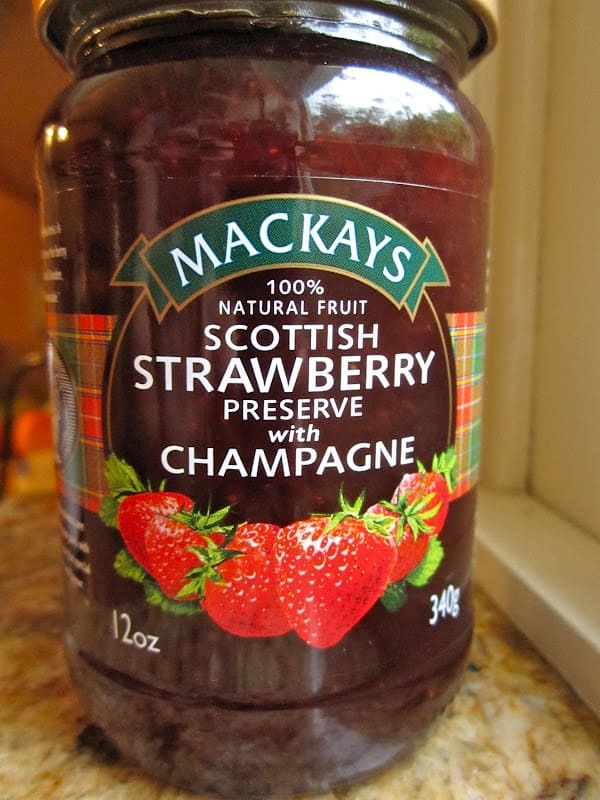 Use homemade or good quality jam, such as this one from Scotland. Strawberry jam is perfectly acceptable, as is raspberry jam, or blackcurrant, etc. Next, make a pot of tea. 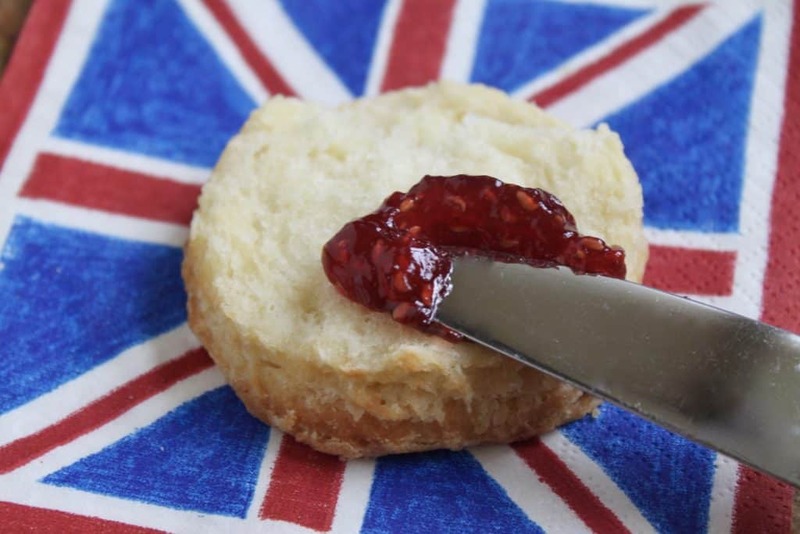 Before I write this next step, I must say that England has one of the most heated debates regarding whether one should put jam first, then cream or vice versa, when eating a scone. The Jam First or Cream First Debate. If you want to read the arguments for and against each position, you are more than welcome. To me, it depends on the type of cream one is using. A thick clotted cream can easily go on first, but if you’re using whipped cream, then that just has to go on top of the jam, otherwise, there will be a big mess! How to Pronounce the Word “Scone”. It depends! There is another debate regarding scones, which is over the pronunciation of the actual word. Coming from Scotland, I pronounce “scone” as if it rhymes with “gone.” Parts of England also pronounce it this way, but then other parts say, “skown” (rhyming with own). The whole debate is actually quite interesting. Milk only; never put cream in tea. And we are ready to serve the afternoon tea scones. Oh my, afternoon tea is just so civilized, and delicious! 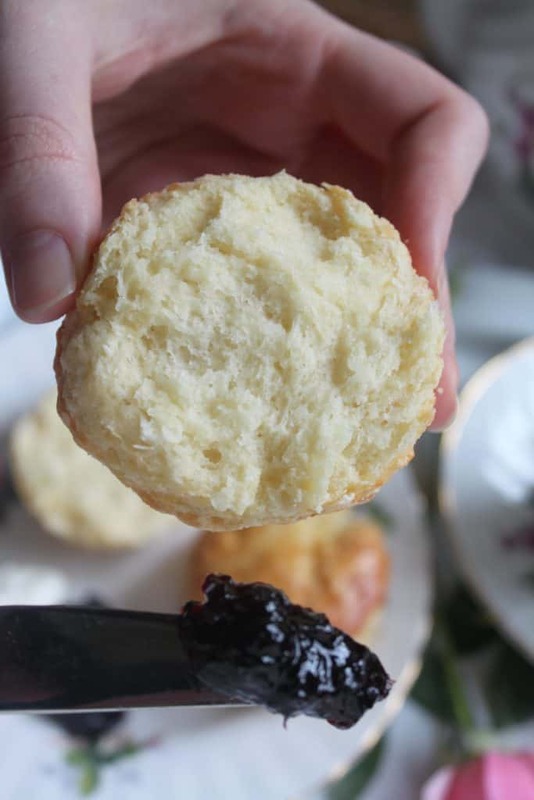 If you’re being more formal, just take a little jam and cream (from your plate, never directly from the serving bowls) and put it on a part of a scone. Take a bite and repeat. 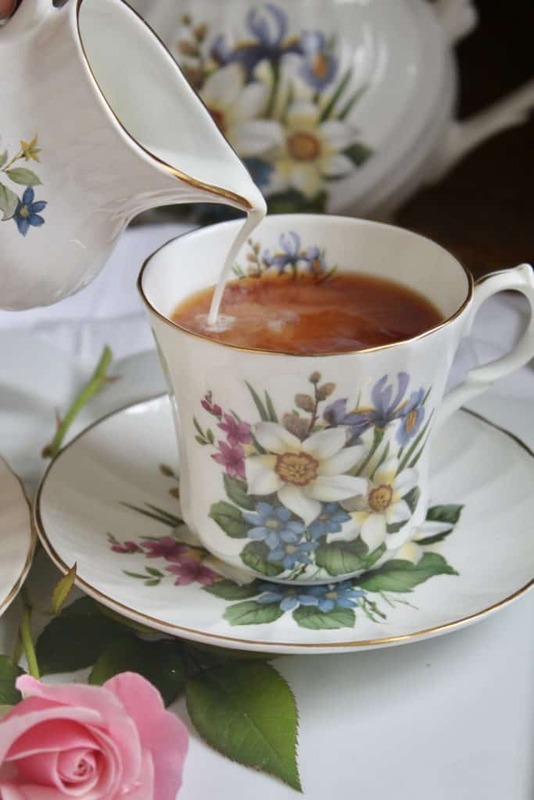 And here’s how to make a “proper” cup of British tea! Don’t miss another post! Sign up for my free subscription for recipes and travel at the bottom of this post. 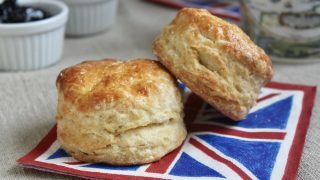 This recipe produces a lovely, light scone, typical of those served at afternoon teas all across the UK. In a measuring jug, put the buttermilk (including the 1 tbsp.) Beat the egg in a small bowl, then pour into the buttermilk. Stir to combine. Place the butter in the center of the dry ingredients and cut with a knife into about 16 pieces. 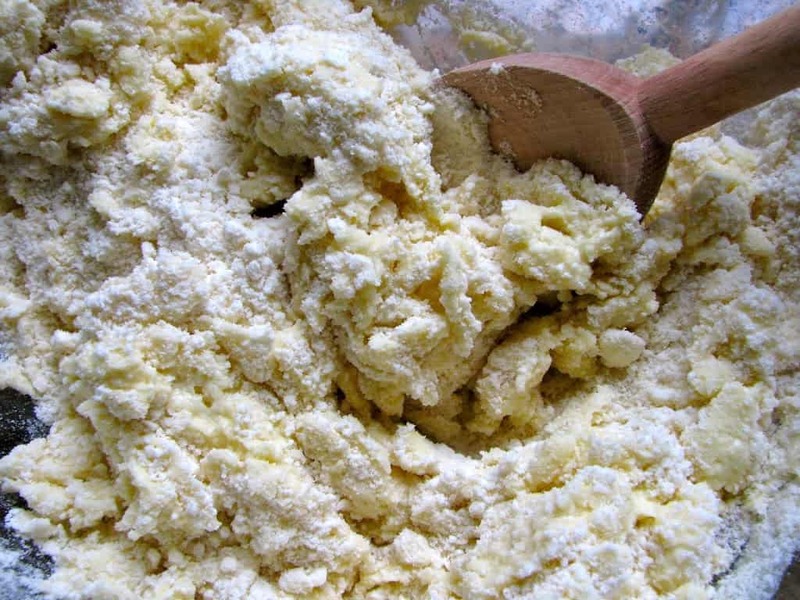 Next, take another knife, or pastry blender and cut/mix the butter into the flour until resembles coarse crumbs, finishing off the pastry using your hands once the pieces have become quite small. Make a well in the center of the dry ingredients and pour in the egg and buttermilk, (reserving one tablespoon of liquid in the jug). Mix gently with a wooden spoon until a dough forms, just about 10 seconds, then place dough onto a clean, well-floured surface. Form into a ball, then pat out, or roll to approximately 3/4″ in thickness. Do not knead the dough or it will make the scones tough. With sharp cutters, cut out scones and place on silicone baking mat or parchment lined baking tray. Gently knead scraps together and repeat until dough is finished, (make a “runt” with the remaining little bit of dough). 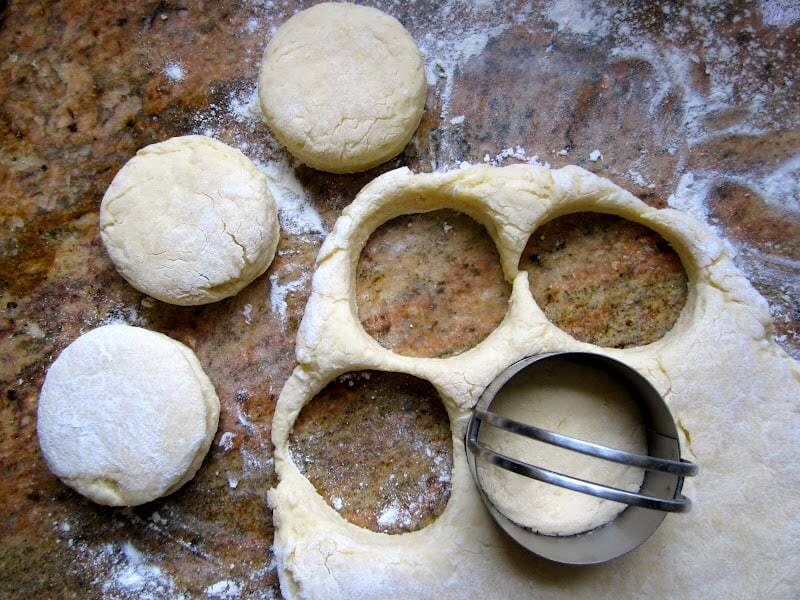 Using a pastry brush, brush the tops of the scones with the remaining egg/buttermilk mixture. Place in middle of preheated oven for about 9 minutes, then turn tray 180º and continue to bake for another 9 minutes or until scones look golden brown on top. Remove from oven, and place in a towel lined basket, or on a cooling rack if you wish to serve them on a plate. Serve with butter, or real cream and jam. I adore all scones. I will make these tomorrow for my twin grandsons. I was introduced to the pronunciation of scones as long ‘o’ and find it difficult to say it with the short ‘o’. I love them just plain, with sorry an expresso. I guess that’s the Italian in me. My Nonna used to make a potato like doughnut, using yeast, like the zippoli my mother in law makes. Unfortunately, there is no written recipe and my mom doesn’t remember. Do you happen to have one? I would love to make them for Easter. I’m sure you know from your Zia in Malpe, that we had snow today. It snow covered trees looked beautiful in the morning, but by afternoon it was wet, dark, damp and cold! More snow for tomorrow! Real April Fools to us in Woodbridge and surrounding areas! check asianjournal.ca for afternoon-tea-scones. It is almost word for word. That is absolutely disgusting. You are correct, they’ve stolen my recipe, but to add to it, they’ve also stolen the image from Waitrose.com! Some chef!! Thanks for the heads up. 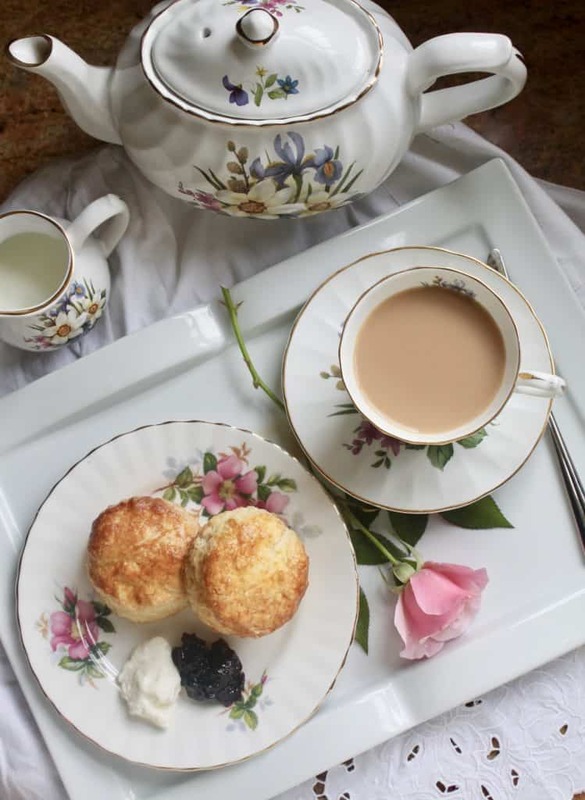 Interestingly, my (N. Ireland) grandmother’s English Tea scone recipe was different in that it used baking power vs. soda and melted butter: : ¼ cup melted butter, 2 cups flour, ½ cup sugar, 1 tsp soda, 1 beaten egg, approx. ½ cup buttermilk. Mix, roll out ½” thick, cut in circles w/ donut cutter, then griddle both sides & edges. And, yes, she often added black currants! What do you think the difference is, Christina??? My grandmother’s (similar recipe cooked on a hot griddle) soda scones we grew up knowing as Soda bread….pretty similar to your recipe. still make it on occasion. Have also researched and found it called Soda Farls, altho’ I believe ‘farl’ is also a term for that triangular shape. Oh your grandmother’s recipe sounds like girdle scones! Only I wonder if she added currants (not blackcurrants as that wasn’t really done)? 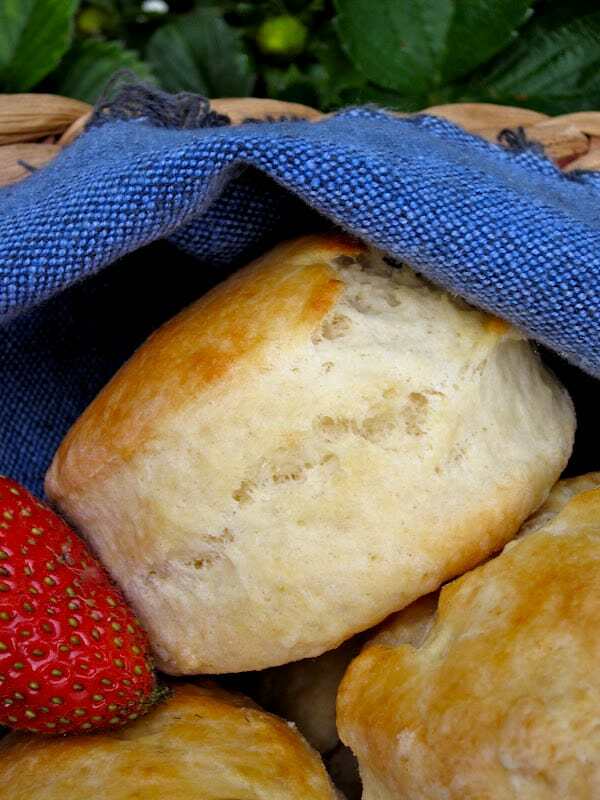 Here is my Girdle Scone recipe–see what you think. Maybe you missed it, but I have a potato ricer on my potato scone recipe and recommend ricing the potatoes, too. I loved the Crown! You must love Downton Abbey, too, right? :) Thanks for your note, Linda! The texture /moistness is perfect – though I used 1/4 c less flour and 1 TBSP more butter. However without butter and jam they have no flavor at all. I think i added too much flour to my scones. is that 284g flour in total or 284g for 1 cup? Therefore 2 x 284g? Gosh, i did double it and found myself having a good battle with the dough :-) Thanks so much, will be making them again today. Oh no! I wish I didn’t have to include cups, but sadly, so many US kitchens do not have a scale! It’s just not nearly as accurate for baking (to use cups). I’m sure they’ll be good if you don’t double the flour, Sylvia. Let me know! Thanks Christina. Im from South Africa so not even sure what the exact measurement would be but the grams are definitely helpful. I made them again last night and OH MY they are delicious!!! These are going to be famous in my house. Hi Christina, first of all, thank you for putting weights in for the ingredients. I’m often searching for something different to bake and get disappointed when ingredients are marked as cups. I’m baking these scones this afternoon. Jennie in the UK. Could I use milk kefir in place of butter milk? I just made these and they turned out really nice, well maybe not as nice as the photo but they taste great. I added sultanas and these taste better than the ones I usually make from the Be-Ro book. Thanks for the recipe Christina. I made these today, they were amazing. They will be a weekly addition in our home. Hi! Loved your recipe! Just what I was looking for. Question though, what’s your process of baking from the freezer? Do you let it thaw out first? Or give it a longer bake? Or let it warm up with the oven and then bake? Great! Glad you liked them, Hillary. Actually, they almost take the same amount of time to bake from frozen, just a bit longer. You can also defrost them. They’re not fickle! :) Enjoy! Hello Christina, came across this while looking for the hairy bikers who you probably know about. my old mum and hers always put a few glazed cherries in the scones. 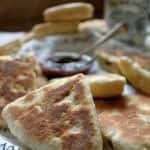 .have you tried cheddar and black pepper in your scones great with chutney yes weird lot us English I know. Cheers Christina I will return thanks again. Yes, of course, I know the Hairy Bikers! I actually have never made savoury scones, but cheese scones are definitely on my baking list! Thanks, Micky! Enjoy my recipes! My husband and I just returned from England, and I’ve been yearning for some authentic scones ever since our return home. I found your recipe and have made them twice already – everyone loves them! And I finally have a go-to authentic recipe. :) Thank you so much! Hi. I found this via Pinterest and couldn’t have been happier. My daughter ( a scone lover) says this is the best one I’ve made. They’re light and rose beautifully. Did collapse a little when stored. The one negative was that we commented on a baking powder taste to it. Could it just be the brand I’m using (We live in Bombay). Would it be ok to reduce to 1 tsp? Absolutely perfect! 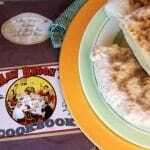 Loved reading, the recipe, everything down to the pronunciation! I’ve been a”sc-gone” girl for 50 years! Jam first, then cream. I loved everything about the story and your recipe is divine. I’m ready to bake and for a couple of these beautiful scones with a large cuppa! Can you help with how I can tell if the scones are baked throughout? I know you said 18 minutes in total, but everyone’s oven is different. To be on the safe side, I always check by cutting one in half, in case they’re under baked and gummy. Lastly, I only have plain 0% Greek yogurt and vinegar, but no fresh lemons to make buttermilk. You don’t have any milk at all? I think the greek yogurt in place of the milk will change the consistency of the dough and ultimately the outcome of the scones. Maybe try to water down the yogurt and a dash of vinegar, but I can’t tell you how they’ll turn out this way. Good luck! Oh good! Thank you so much! I am looking forward to trying these. You’ll love them, Shelley! Let me know how they turn out! Thank you for this lovely recipe and post. Ever since my first cream tea on a visit to England 30 years ago, I have tried to replicate a perfect scone and clotted cream to match my memory. 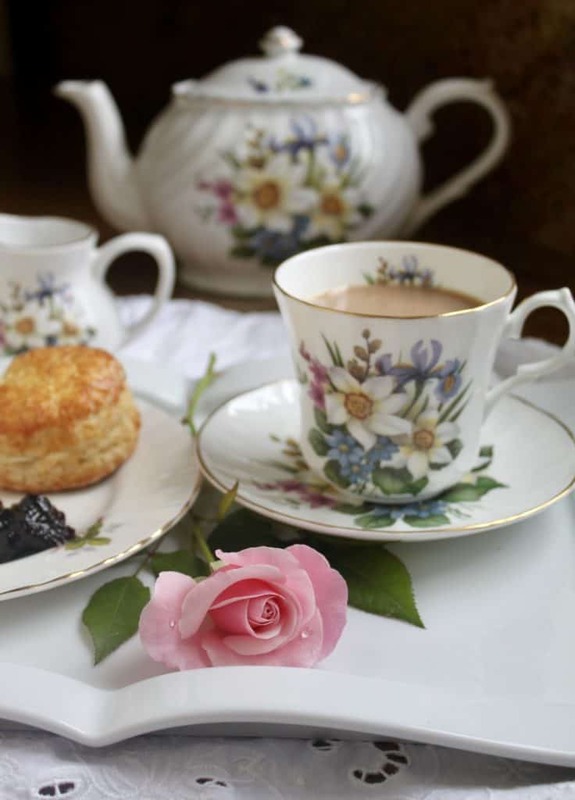 I remember that all of the dairy products were incredible, which is a big part of the deliciousness of cream tea: beautiful butter in the scone, a dash of high quality milk in the tea and luscious clotted cream on the scone. During my early experiments, it was hard to find really good butter or milk and impossible to find clotted cream. Thankfully these products are now more readily available in California AND I found YOUR recipe. Your scones are perfect and I love your suggestion to set aside a spoon of the egg/milk to glaze the scones, because it gave a lovely sheen to the finished scone. Every other scone has been too sweet or too rich or not light enough. These were perfect. I paired them with a perfect cup of tea, som Devon cream (care of Amazon) and homemade plum jam from my mum! Next I plan to make clotted cream at home from some local cream from grass fed cows because it’s so expensive by mail and often doesn’t arrive in fresh pristine condition. This recipe goes into the permanent file!! Thanks for sharing this recipe!! It is wonderful! I love the subtle salty taste with pinch of salt added! They are soft, buttery and flaky as well. *On a side note, I have also substituted 1/4 cup of all-purpose flour for low protein flour and added 1 tsp of vanilla essence. Happy to hear it, Ee! They are lovely scones, enjoy! Hello Christina, I have never commented on a recipe from a website before but I thought this recipe deserved a quick note of recognition. I’ve made your scones about a dozen times now, they are an absolute family favorite and my go-to when hosting a tea. 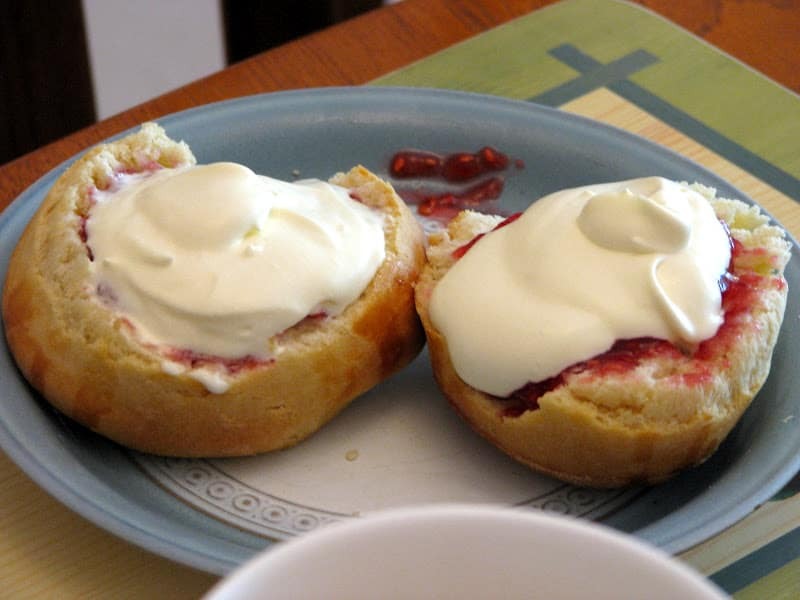 I’m from the US and lived in Australia for a few years where their scones seem very similar to these and I couldn’t get enough of them. So when we moved back I went in search of a solid scone recipe and found yours. Thank you for posting this amazing recipe and with such detailed pictures. Quick question, have you ever used almond milk for the buttermilk? Half of my family has a dairy allergy and I know they would love to try these delicious scones. Oh you are so sweet, Michelle! Thank you so much for taking time to write this comment, I really appreciate it! So glad you and your family enjoy them. Just a little comment…. I have my Great Grandmother’s handwritten scone recipe (Scottish) dated 1909. She notes to reserve two tbsp of liquid to glaze the scones before baking. Another blogger didn’t plagiarize you. It was being done more than 99 years ago. My husband is from the UK and we met in the US when I discovered your website. It has been a blessing with all your recipes making it easy for me to make some of his favorites like Scottish eggs etc. We have recently moved to the UK and are currently buying a house up in Scotland near the Dundee area so I have referred to your recipes a lot. My mother-in-law is very jealous and tries to tell me you don’t know what you are talking about because you live in the US now despite telling her of your acknowledgements etc so I continue to cook using a lot of your recipes and tell her nope its not from “Christina” until afterwards when she says how delicious they are. Thank you so much for helping me to bring some Scottish cooking among my family again we ALL love your recipes and you make it so easy and fun to make!!! Wendy, I can’t thank you enough for your note! You’ve made my day (and I’m in Como, so that’s saying something)! Love that you love my recipes despite your MIL 😂 Thank you! I keep forgetting to tell you I made these for the wedding last month. I got up at the crack of dawn…literally. I even made clotted cream to go with them. They were a huge hit, I just wish my waistline would let me do that every week! 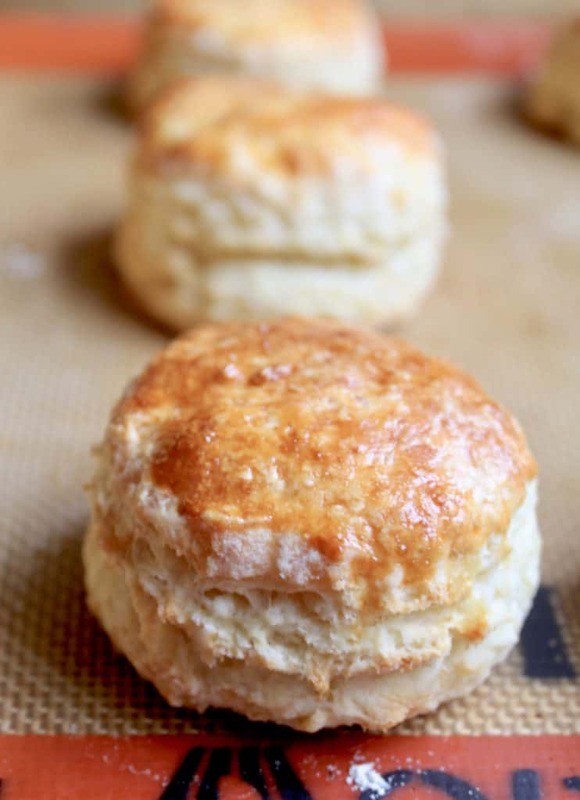 I chanced upon your blog and saw the amazing scones and thought I am going to try to bake these for the first time as I have buttermilk at home . Can I use self raising flour and omit the baking powder instead ? Thanks !!! That should totally work, Carole! Let me know how it goes! Hey! scones taste really good, I made them a couple of times. Though they didn’t look as good as yours still they were pretty good in taste. Thanks, for sharing the recipe!! Fantastic, Martha! The taste is the more important thing; happy to share! You’re very welcome! Christina, I made your recipe instead of my old one for the wedding. We liked the lightness inside. I will make them again, thanks! I’m sorry, Myrto, you’re not the first person to tell me that you couldn’t give a 5 star rating :( I’ll add 5 stars so that it will at least average out to 4.5. Hi Kathy, I don’t know that I would do that. The better option would be to make them and freeze them, then brush them with the egg wash and bake them. I know that this method works well. Enjoy! These scones/biscuits are delicious, aren’t they? I’m just as likely to spread them with honey or jam as top them with a chunk of sharp old cheddar and a piece of ham. And they freeze well and thaw quickly in the microwave if there are leftovers. There is nothing better to me than a homemade scone ( oh, she also used currents) with Devon cream and homemade strawberry jam. Heaven! Yes, these aren’t very sweet at all. That’s so lovely that your Nana’s recipe was so similar! I do like raisins, currants or sultanas in mine, but rarely add them! That is certainly one double whammy bumper post on how to make scones like in the UK, Christina. Agree totally on your tips – especially the good quality ingredients and weighing them. It’s funny – they’re popular in some tearooms around Paris – but one of them had put so much bicarbonate of soda in them, that I went home with a kind of film on my teeth – almost as if I’d brushed my teeth with scones! I should point them in your direction here – as I only really make cheese scones. Love all the topping possibilities, too. Thanks, Jill! Oh dear, that’s terrible when anything has too much baking soda in it! I still have to make your cheese scones! The scones looks delicious! I wish we had something like afternoon tea in this country. It’s such a lovely tradition. Agreed, but I just do it myself or go for afternoon tea once in a while. You can always find them in big cities, at least. Hi Christina, I have a recipe to make your own clotted cream and it is really good. One pint of fresh heavy cream. Hi Beverley, I’m just seeing this comment now! So sorry! Yes, clotted cream is actually very easy to make! I have been planning to share how to make it, but so many other recipes and travel posts to share, too! I have a question, can I make the dough the day before I bake them? Would you roll out and cut or would you wait until you are ready to bake? Just made these with sultanas in, delicious! Oh thank you for the review, Kate! I was getting ready to leave for Auckland and missed this comment (I see by the date). I need to make some with sultanas, too! I miss them. Hmmm. 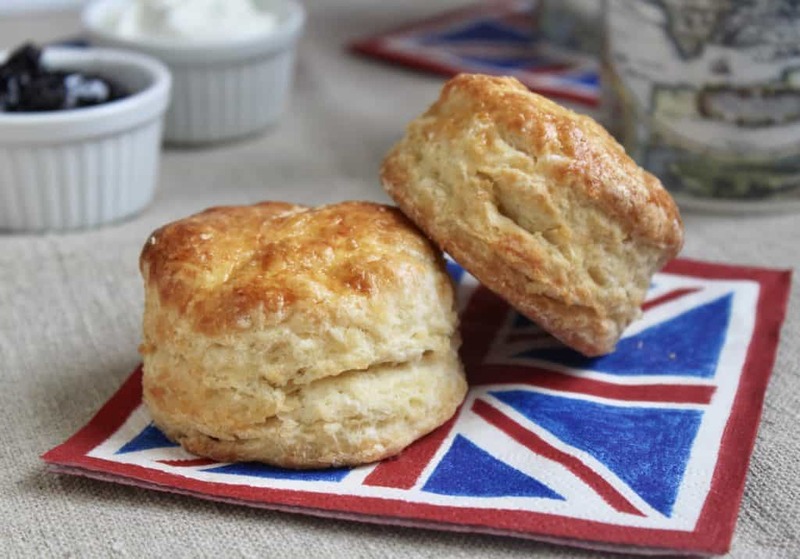 So delicious – I’ve made these a few times now and by far the best scone recipe by far! Thank you so much, Helen! What a compliment! :) Happy new year! Just found this on Pinterest and am going to make them right now! I’ll be back with results shortly. I can hardly wait…and I just bought fresh cream too! Ooh! HI Cristina don,t know what I am doing wrong but cannot get them to rise like yours, do you think it is the BP? They are good tasting and light just don.t get the height Made them quite a few time but no luck. Hi Agnes, maybe you’re rolling them out too thin? Don’t overwork the dough, make sure you have fresh ingredients (especially the rising agent) and try making them double the thickness and let me know what happens. Good luck, wish I could help you in person! I just had the same problem. The scones did not rise. How many should this recipe make? I did use fresh ingredients. I think I patted dough down too much and should have used a smaller cookie cutter. What size cutter do you use for these? They tasted good!! If choosing to use currants or other dried fruit, at which stage if the mixing do you add them? Hi KC! Sorry, I’ll add this to the recipe. Once the flour goes in, you can add the fruit as you don’t want to over mix the dough. Enjoy! Hi !! help … when i did this the bottoms where floury and hard .. what could i of done wrong? Hi Madelyne, I have absolutely no idea why the bottoms were floury and hard. Did you bake them near the lower part of the oven? If you follow the directions exactly as written, they should turn out perfectly. I lived in the U.K. For a few years and fell in love with scones. Currently deployed we have a British nurse who is turning 40 years young tomorrow….I wanted to make her something special and sought out a scone recipe since my boyfriend sent me some clotted cream. Just made them and baked a test batch…and it was a hit…I had to let her try it out. Unfortunately we only had powdered eggs and buttermilk to work with but they still turned out pretty good! Can’t wait to get home and try it again with fresh eggs and buttermilk! How lovely, Nicole!! I’m sure you made her day! Thanks for letting me know and THANK YOU even more for your service!! I seem to be the only one having a problem making these. I’ve tried twice and they don’t rise. First of all what is the measurement for flour. Is it 2 cups which is 16 oz? I tried 10 oz – I cup of 8 oz plus 1/4 cup/2oz. That was too wet. So I had to add flour. I bought new baking powder in case that was the problem. Am I just not making them thick enough or big enough? They are tasty just not rising nicely. So sorry you’re having a hard time, Anne. No, 2 cups of flour is definitely not 16 oz. You’re getting mixed up with weight and volume which is the source of the bad results: you’re not using the correct amount of flour. I put 2 cups of flour for US readers who only have cups as a measuring tool, and the 10 oz for those with scales. I HIGHLY, HIGHLY recommend using a scale for baking because you’ll never have these issues. It is very precise, and just so much better than using cups to measure. They are so inexpensive, too (http://amzn.to/2nFH3T2 -affiliate link). I made these for my daughter and grandughters for tea. We usually go to our favorite tea house, which my daughter and I did. My granddaughters were in school and we were scheduled to be away for a soccer game this weekend, when the game was postponed I decided to do tea for them. These scones were delicious! We had tea sandwiches, scones, lemon coconut bread and Earl Grey tea. They loved it! Thanks for sharing your recipe and great directions. Can’t wait to try these. They don’t seem too sweet to eat on their own. Thanks for the fabulous step by step pictures. Hi Christina! 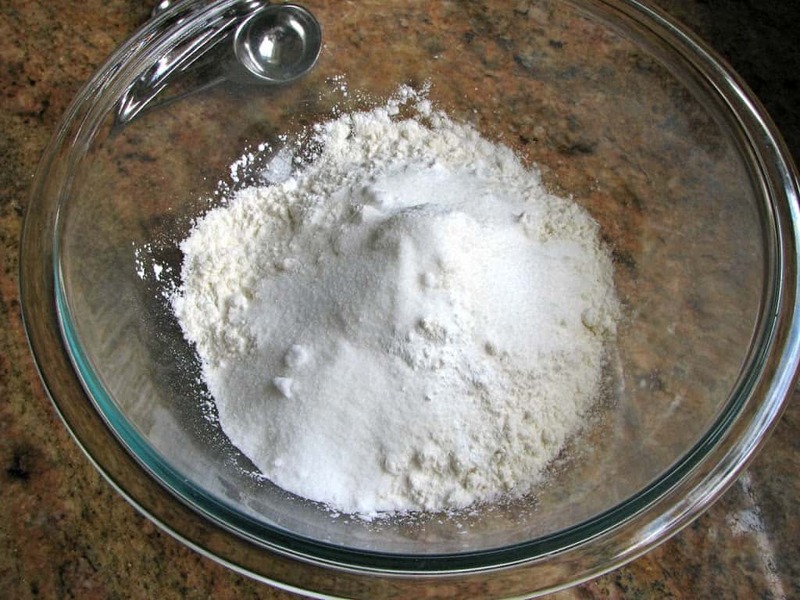 May I know for the flour – is it all-purpose-flour? Yes!! Enjoy the scones, Fiqah! OMG fantastic scones! Please explain how BOB got so lucky to marry you! Great Carbonara recipe too Christina! Hi! Wondering when baking from frozen, how long shall I bake for? For the cream you just whip whipped cream? That’s it? Any recommendation about it? YES! In the UK, there is no such thing as Cool Whip, so real cream is whipped until it becomes stiff. Don’t keep whipping after it stands in peaks or you will end up with butter! :) If you like it sweeter, add a tiny bit of sugar before you start (less than a teaspoon), but if you want to stay authentic, no sugar. Enjoy, Sara! Can’t thank you enough for this recipe. 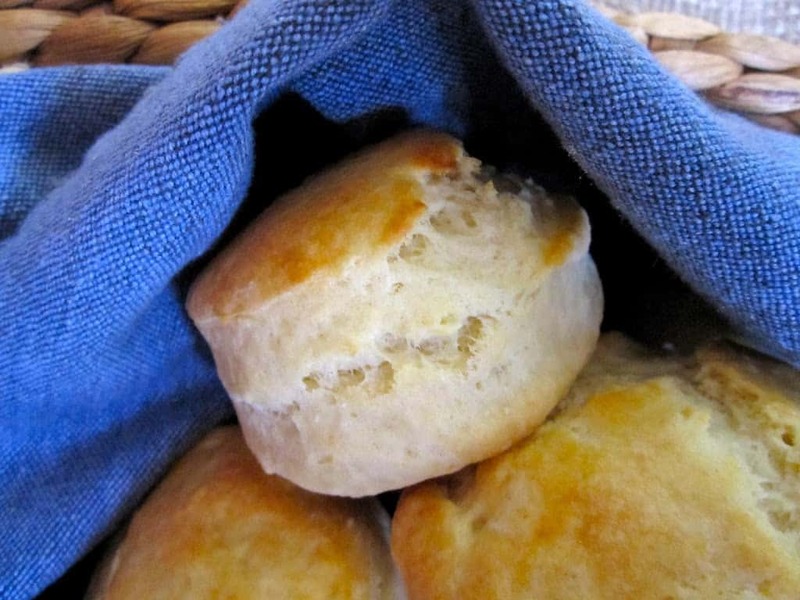 I was looking for a simple and yummy scone recipe and this is it. I found it a few months ago and I’ve made them several times. They are wonderful. I must admit the first couple of batches were somewhat of a minor disaster, as far as visual appeal went. They tasted great, but were a funny looking lot. I’ve since learned to make them the same way I make my regular buttermilk biscuits. Now, they look as good a they taste. Thanks again! HI can the scones be made a day or two before? Hi Sapna, they won’t taste as nice as they do the first day. What you can do is make them, cut them and then freeze them raw. The day you want to bake them, take them out, brush with the egg and then bake them as usual. 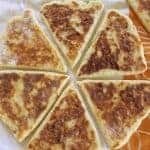 Hi Christina I love your beautiful site and the recipes you put up, My husband is German and Scottish so he enjoys the recipes I make from your sight. Unfortunately I was diagnosed with celiac several years ago so I am limited what I can make for myself. I use Bob’s Red Mill 1to1 baking flour. It works pretty well most of the time, Your afternoon tea biscuits look delicious, would you have any suggestions if I tried to make them Gluten Free? Believe me I know they won’t be the same as yours but maybe I could just get a little bit of an idea how good they are, Thank-you !! Oh thank you so much, Lanie! I really appreciate your kind words, but I am so sorry that you are celiac now :( I have friends who are also on GF diets and I can only imagine how difficult it must be! I’ve made many scones, and look forward to these which seem much less “americanized”. It seems there is a recipe for every kind or variety of sweet or savory scones you could imagine! These will be perfect for home made jam and mock Devonshire cream I make and serve at my teas (and never cool whip). I skimmed through the comments, and hope I am not duplicating a comment. The first ingredient confused me. “2 cups (10 oz) flour” – do you mean 10 oz total, or 2 cups that are 10 oz each? Thank you for the clarifcation. I too love to bake half a batch and freeze the other half. They are so nice to find in the freezer for a last minute guest! Thank you so much for this recipe. I share your love for scones and sadly live in Germany, where they can not be found. So I decided to try out a recipe and yours is the first one I found on Pinterest. I am going to make my first batch of scones for Father’s Day, as my daddy absolutely adores them too. Thank you for the lovely message, Emily! Ironically, I am writing about Germany right now! I just went on a Rhine River cruise and am writing about my 3rd day. Please let me know how the scones turn out for you-I’m sure your father will be so happy! I just returned from second trip to Ireland and this round, fell in love with scones! I have no clue how I missed them first round but holy cow I was missing out. In Galway, there is a fabulous tiny tea house called Cupean Tae and is, hands down, my most favorite place on earth now. The cream and jam they provide is delectable. Since returning, my dear friend and I have been craving scones so I began scouring Pinterest for a recipe. Yours is the first I attempted and I followed it to a T. The scones came out beautifully and so heavenly. I spread a little homemade pomegranate jelly on the scone and felt all the stress leave my body. Thank you so much for this recipe! Never even reached the oven, just a sloppy mess – everything else was the same as normal I think – has anyone else experienced this and should I stick to good old fashioned butter in the future? Oh dear, yes, stick to butter, Ian! Here is what you used: Blended Spread 78% (52% milk fat & 26% vegetable oil). I sure will. I did google it first and a famous cook said it was ok but from now on its BUTTER. NO SCONES FOR MY TEA TONIGHT LOL. Perhaps Lurpak should state not suitable for baking?? Your way or no way now!!??? Gorgeous scones Christina! Light, delicious. Perfect accompaniment to afternoon tea! Must try these with the clotted cream. 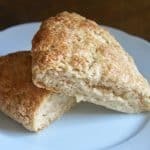 I have been looking for a simple no fuss scone recipe for years! (since I came back from England actually, and that was in 2008!) And yours is just perfect, I live in Mexico now and finding certain “specialty” ingredients is quite difficult. Thank you so much for sharing! Yes, for the larger ones I use a 2 3/4″ cutter and for smaller one, 2 1/4″. If unexpected guests turned up at our door in the afternoon my Mother would rush to the kitchen and “bash up a few scones” (her words). They were always delicious, often with just good butter and home-made strawberry or raspberry jam. 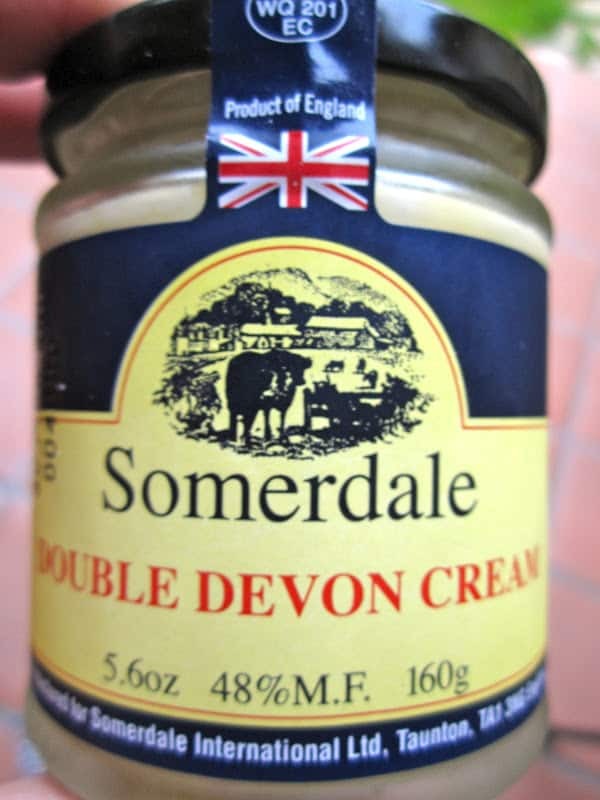 I don’t ever remember her serving cream with them, but I found out about that when I married a guy whose Grandmother lived in Devon. Total deliciousness! Now, one of my favourite breakfasts is cheese scones, with some Kerrygold butter and a little bit of good ham. And scone ALWAYS rhymes with gone! Your story about your mother making scones when guests turned up made me think of the time I was in the midst of making scones when my guests rang the doorbell. I must have been in the process of adding the dry ingredients and it wasn’t until we took our first bites that I realized I’d forgotten to add the sugar! Oh dear, they tasted terrible, but my guests were so gracious anyway. At last a recipe when my scones don’t need to be used as stones. Thank you. These look lovely, and I will definitely make them today, Sunday! If I don’t have buttermilk on hand, I mix some sour cream into milk and use that. (good quality sour cream, with very few additives, if any). My mother always adds grated lemon peel to her scones. 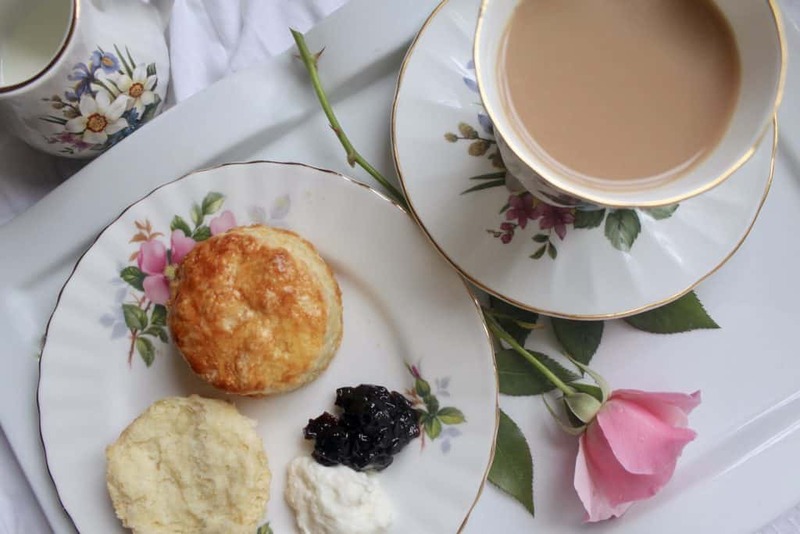 We had some divine scones in a lovely tea room in Niagara-on-the-Lake many years ago, and that’s what they put in their scones, and she has done it ever since. Really adds a nice touch to the scones. Absolutely, Christel! The name is a bit of a misnomer, right? Lemon peel is a really nice touch, I agree. There are so many ways to make scones, and must say, I don’t think I’ve ever had a flavor I didn’t like. :) Enjoy! 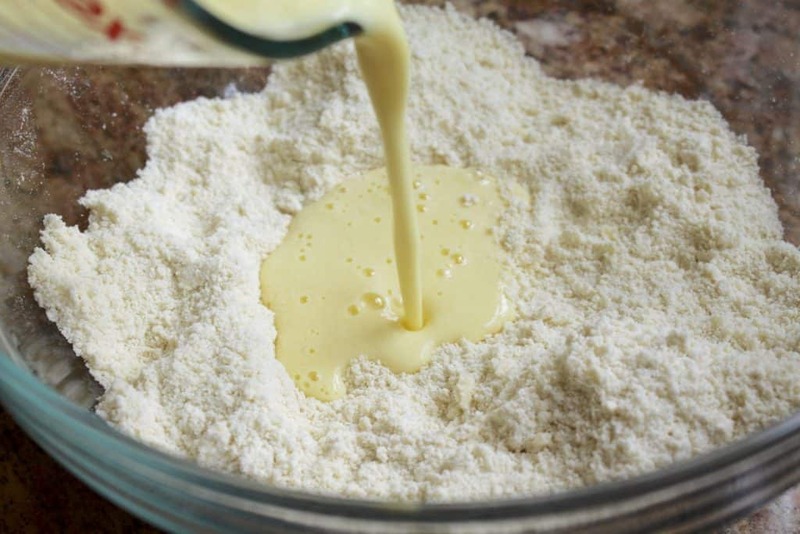 I never have buttermilk on hand either, so I use 1tbsp white vinegar per cup of milk. Let it sit for about 5 minutes to thicken up/sour the milk. That’s what I do, Jennifer, except I like to use lemon juice instead of vinegar. 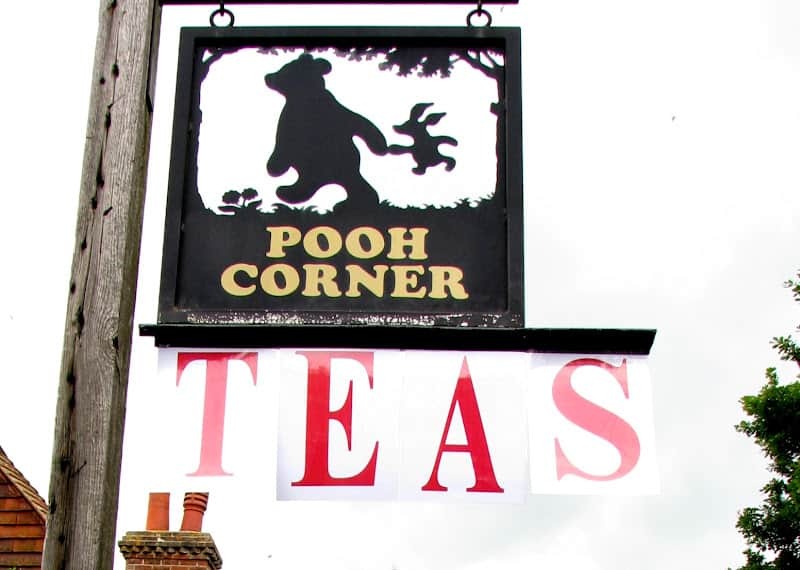 You’ll love the scones! I used natural yogurt Christel instead of buttermilk as I always have it in the fridge and they were perfect. Will try Jennifer’s idea though but would it work with semi skimmed milk. I’m new to baking!!! Wow! Good to know, Ian! Yogurt mixed with milk would have a more liquid consistency, but since you already tried just with the yogurt, maybe it’s not necessary. Glad you enjoyed them! Another lovely recipe Christina. It is the perfect day here for some scones for afternoon tea as it is very wet and miserable outside. Now to decide what scones to make. Since I live in the UK I can quite confidently state that these scones look like some of the best I have ever seen! I’ve always been able to make lovely scones though but since I am following a gluten free diet, I am still experimenting and haven’t yet managed to make them as good as I did previously! 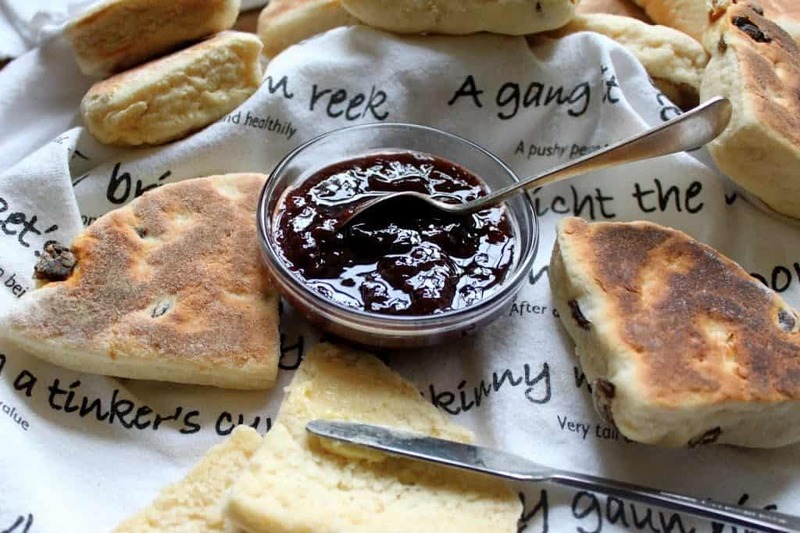 Scone does rhyme with gone, IMO it DOES NOT rhyme with bone AND it’s definitely jam first! Oh my! Don’t these look heavenly!? I just devoured your tea ime tips and now I shall devour your special scones as I must get these (quickly) into my tummy. I love your Blog. hmm, I’ve been reading it for so long this morning, I’m not sure how I linked to it, Savory Simple I believe.. I’m going to make your apple crumble today, looks delish! Next will be the Afternoon Scones. my mom is a great believer in tea and bread, picked up from her Scottish friends that not one bit of talent or desire to bake. I used to give them homemade British or Italian foods that, if simple enough, would always enjoy! Thank you for your lovely ideas and recipes! I’m making this right now, using powdered buttermilk. Smells great in the oven! I am just desperate to make these scones I remember all the good bakeries in Glasgow Scotland, It is funny they did not have any problems making all these goodies as they sold at the end of the day not any leftovers the next day. To get back to my problem it is bitter cold where I am in Canada so cannot get out for the buttermilk Is there anything else I could use I have sour cream but when I think about it don’t think that would work maybe have to wait until the weather clears up. The problem was they don’t rise as much as yours and they remained uncooked inside in some parts! Also, my oven does not have 400 c , the highest is 250 c, and so I let them in for around 15 mins each turn. I’m so sorry you are not having good luck! The oven temps are in Fahrenheit (I just added the Celsius temps for you) so that could be the problem, especially if they are still raw inside; I don’t think they are rising because they’re not finished cooking. Also, if they’ve been in the oven for half an hour and they are still raw inside, there’s definitely a problem with the oven temperature. Do you have an oven thermometer? I would invest in one (they’re very inexpensive) that way you know EXACTLY what temperature you are dealing with, because your oven calibration could be off too. I would set the oven to 200 degrees C, for example, then after having it come to temperature, check it against the thermometer, and see if it’s actually 200 degrees C.
I also found you from the Downton Abbey page. I made your scone recipe today and they were really good! I am also from the UK (England) and have tried so many recipes since living here! Will definitely make your recipe again! Thank you! By the way, I found your page from the Downton Abbey Recipes pinterest page. Hi, I found you from the FB page for FBLA. I wasn’t at the last meeting, but hope to meet you soon. Lovely post and pics! I make small scones and keep them in the freezer, also, for quick breakfast treats. I also love all things Italian and I’m having fun getting to know your wonderful blog. Brava! Wow! Looks great, can’t wait to try this!